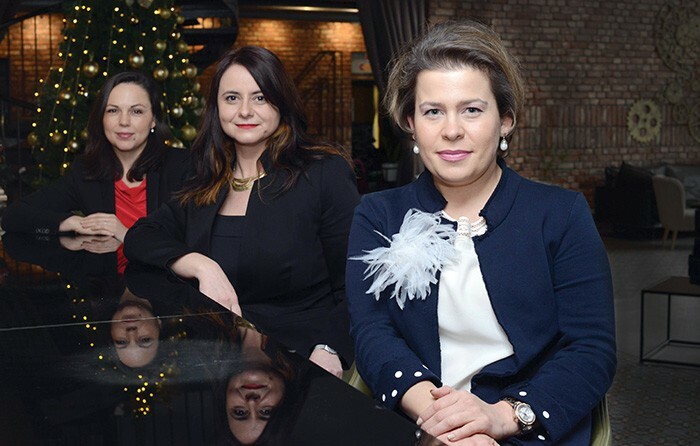 2019 will be the year of unification of the private sector and equalization of its voice, say the three interlocutors for Kapital, the executive directors of business chambers in the country: Diana Despodov from the American Chamber of Commerce – AmCham, Anita Nikova-Bundovski from the Chamber of ICT sector MASIT and Biljana Markovic-Stamenova from Macedonia 2025. They say that a big step forward in the cooperation between the chambers of commerce has already been made and that trend will continue this year and grow because, according to them, the entire private sector is united and together they locate the challenges and everyday obstacles in the process of their work. The pre-announced economic year has started, and with it the economic opportunities and challenges that await us. To find out how the business sector is preparing for the economy in 2019 and what economic parameters are important for the development of the economy and improvement of the overall social situation, we invited representatives of several chambers of commerce and business associations to discuss the topic of the Macedonia’s economy. On the other side of the table are three speakers of the business sector: Anita Nikova-Bundovski, from MASIT, Chamber of the ICT sector, Diana Despodov, from the American Chamber of Commerce – AmCham and Biljana Markovic-Stamenova from Macedonia 2025, whose organizations already jointly act as representatives of the private sector. The ladies radiate enthusiasm and energy since the early days of 2019. They are ready to take the bull by the horns and fight for better cross-sectoral dialogue in order to promote the economic climate in Macedonia. Unanimous and united, together representing hundreds of companies from the Macedonian economy that employ thousands of citizens, in a constructive manner of true leaders they shared with us their views on the parameters that determine the extent to which we will live the announced economic year. Throughout the conversation they say that the business community does not expect an economic year, but a year of uncertainties regarding the legislative changes affecting the business. “The business sector is a locomotive that drives the economy and in order to be able to operate at full steam, it is necessary to have an environment that is characterized by predictability, equal rules of the game, the rule of law, transparency and the elimination of the grey economy,” says Diana Despodov, executive director of AmCham. “We do not criticize politicians, but policies,” she says, “because politicians come and go, but policies remain and affect the economy for decades,” she adds. Unlike the huge announcement for the economic year, their attitude is more cautious and aware that the parameters left behind will greatly affect the development of the economic system in the year that has just begun. “This year Macedonia’s growth rate was between 2.8 and 3.2%. According to the World Bank analysis, if the GDP growth is 5% Macedonia will reach the EU standard in 30 years, and if the GDP growth is 10% we will reach the standard in 15 years. From this it is clear that we need a more aggressive growth and serious reforms in the economic system, “replied Diana Despodov, analyzing the realized economic growth of Macedonia. According to her, it’s high time to start moving the economy forward by creating real value and growth, rather than relying on subsidies that do not motivate entrepreneurs and don’t inspire growth and development. Anita Nikova-Bundovski from MASIT, added that we should think about a knowledge-based economy and have more planned approach in the programming of regulations and reforms. This, she said, is something that is currently lacking in the business community in Macedonia, both domestic and foreign. Contrary to the government’s claims that each regulation is carried through a transparent public debate, our three interlocutors say that “the business community is not sufficiently esteemed,” stating that the trend has not changed for years, including the past year, and as they say, several laws have been developed without prior and proper consultation with the business sector. The manner of adopting the legislation should be changed and the planned changes announced in a timely manner, at least one year in advance, “says Nikova-Bundovski. “When progressive tax was introduced in Croatia, the changes were announced five years in advance and all factors in the society – the administration, the private sector and the citizens had time to consult and adjust to the new regulation,” adds Despodov. The lack of predictability in the regulation leads to uncertainty in the private sector that results in reduced investment and increased attention that does not inspire growth and development, say the ladies. Our interlocutors say that when the increased administrative burdens are added, as well as the lack of a strategy to attract additional foreign investment, we are facing a business climate that stagnates and discourages. “We are often in contact with representatives of companies from abroad who have made connection through economic promoters or members of the diaspora and want to invest in our country. The past two years we’ve seen a negative trend of inadequate communication and position of state institutions and officials towards potential foreign investments. During the pre-election campaign it was like they “demonized” foreign investors, who bring benefits to the state through stimulating the economy and additionally contribute through new technologies, knowledge transfer, paying taxes, developing skills among employees, etc., which the state should take into consideration “, commented Markovic-Stamenova, referring to the treatment towards the foreign companies in our country, which, as our interlocutors agree, are a big and serious factor in the Macedonian economy and at the same time they promote our country to their foreign trade partners. Our interlocutors say that they are constantly receiving complaints from foreign companies who mostly complain that in key economic positions are assigned to people who do not have the capacity to lead those sectors. By conveying the experiences from their communication with foreign companies operating in our country or are interested in investing here, they conclude that without suitable people, key economic policies can not be implemented, nor could the existing investments by foreign companies be retained in the long run. Still disappointed with the way in which the new Personal Income Tax Law was adopted, the representatives of the three chambers remained unanimous in their view that although they asked to be involved in the adoption of those key regulations for the private sector and offered expertise and resources for careful devising of the economic policies, they state that their claims and remarks were ignored. “As an example, the public discussion for the draft law on personal income was scheduled only after the draft law was submitted to Parliament and the social actors reacted to the lack of public debate. This shows us that they didn’t want to hear the feedback of the private sector. Additionally, claims were made that the private sector does not want to pay taxes, which is ironic when it is considered that the state budget is mostly filled by the fees from the private sector, where salaries and contributions are higher, contrary to the state administration that discharges the budget or civil society organizations that are not a significant economic factor. We just wanted extra time and analysis to make a meaningful tax reform and develop a tax strategy that will really be progressive and will match the local circumstances and the level of economic development. What we now have is not a progressive tax, but a flat tax with two rates. For example, why don’t they abolish the personal income tax for those who take a minimum wage? If the goal was to have some social equalization, why don’t we increase the rate up to 25% for those who take, let’s say, 5.000 Euros? Currently, those who earn 12.000 denars and those who earn 90.000 denars have the same tax rate. I don’t see progressiveness here, do you?”, asks Diana Despodov. Biljana Markovic – Stamenova reacts to the attitude of public servants towards foreign investors and offered information for several companies that have dislocated their headquarters from Macedonia as a result of inadequate policies and measures. “The retroactive VAT payment made several of these foreign companies to leave the country. These were companies from smart industries. They were ordered to pay retroactive VAT on their export invoices, for the last 5 years”, disclosed Markovic-Stamenova. “Several Macedonian companies have announced that as a result of the changed tax rates, they will transfer their operational activities to Bulgaria and Estonia,” she adds. Anita Nikova from MASIT, comments on the lack of government strategy for economic growth. “The government never presented any solutions for dealing with the grey economy, and their statistics show that Macedonia’s grey economy is estimated around 30% of GDP. In conditions like this, we expect further increase of the grey economy which is detrimental to the private sector as it leads to unfair competition”, says Nikova-Bundovski. According to her, the Macedonian authorities have no strategy to approach foreign companies around world and present investment opportunities. We do not have documents and promotional materials, she says. “We are not promoting our country anywhere, we have four ministers for attracting foreign investments, I do not know who they are or what are their names. The fact that someone who works on this subject does not know who are those ministers is defeating”, comments Nikova-Bundovski. “Do we have priority industries? Did anyone asked us what kind of investments are needed for our industries? Because we know exactly what every industry needs, “she added. Diana Despodov adds to the subject, emphasizing that there is no strategy for the bitter problem of lack of staff, as well, both professional and unskilled. “The strategies of the Employment Agency for re qualification and further qualification are not based on the real needs of the labor market, perhaps because the business community is not consulted when these strategies and policies are adopted”, said Despodov. With the same passion as before, our interlocutors continue to comment on the challenges in doing business in our country, such as the gray economy, corruption, as well as the imposed bad attitude towards the business community, and as they say, the distorted perception for the foreign investors, who, according to their impression, are notorious as exploiters and usurpers. “We have 10 investors from the diaspora who gave up on investment. Instead of focusing on economic development and attracting new investors, we are focusing on extracting as much money as possible from those who are here”, says Biljana Markovic-Stamenova. “As long as people are hoping for employment in the public administration, the development of entrepreneurship will not reach a satisfactory level. In a situation like this, where people are still eagerly waiting for a job in public administration, even if we attract big companies who will work in those companies? I have spoken with companies that currently have 250 free places that they can not fill. Let’s not deceive ourselves, what we lack is not just programmers. What we lack are machine fitters, welders, elevator installers, etc.”, comments AmCam CEO, Despodov. The topic of the brain drain from Macedonia is all the more painful for the Macedonian economy, whose development depends mostly on the professional staff that’s diminishing. In this conversation, we also reflected on the emigration of young people, and according to our interlocutors, this leads to a growing struggle for the survival of the private sector. Adding to her reply, she says: “In order for the private sector to relax and start investing in its employees, it needs foresight, stability, the rule of law, it needs a grey economy so small that it is almost imperceptible, it needs loyal competition, transparency, absence of corruption. Anita Nikova-Bundovski from MASIT followed this issue, where, as an example, she mentioned the IT sector, who constantly works with foreign partners. “For that cooperation to be in continuity,” she says, “we are constantly finding ways to invest in the development of human and company certificates.” In addition to her response, Nikova raised the issue of the willingness of the Macedonian managers, as well as the investment in knowledge by the domestic companies. “The competition should not always be the only thing that challenges us to invest in our staff. We need to take an extra step in the development of the mentality, and education of people in managerial positions. These certificates are a guarantee for foreign companies. The country you come from doesn’t promise anything, but the company’s certification and human capacities are a serious assurance”, added Nikova-Bundovski. During the conversation, we asked our interlocutors about their views and suggestions on how to increase the cooperation between foreign and domestic companies. Namely for the cooperation between domestic businesses and foreign companies, because economic indicators say that it is unsatisfactory, resulting in a very small trade. “It’s absolutely true,” says Despodov, “that there is very small cooperation between foreign investments and domestic companies as suppliers. But, “she continues,” it is presented to the public that the foreign companies are to blame, that they apparently do not want to cooperate with domestic companies. From my experience and conversations with companies, I’ll say that there is much more interest among the foreign companies to work with domestic ones. However, they often encounter problems such as lack of standards and certificates from domestic companies, and the domestic entrepreneurs are unwilling to invest in their own businesses and obtain the necessary certifications that foreign companies are requesting. Macedonian companies love their comfort zone and status quo and are not willing to invest either money or labor to bring the standards to a level where they can serve as suppliers to foreign companies. It is also problematic that domestic companies often fail to meet the delivery deadlines and other terms of the agreement. So, we have a two-way problem here. Firstly, the foreign companies should make a bigger effort to identify the domestic companies that are willing to invest and increase their standards, but on the other hand domestic companies need to show a little more interest to develop to the extent that will allow them to serve as suppliers of foreign companies”, explained AmCham’s Executive Director. We brought the conversation to its end, although the enthusiasm and the passion that glued ​​us on this chairs, seated across each other, made us completely lose sense of time. And for nearly three hours our conversation flowed through the spacious restaurant “Four” in Hotel Park. While we were locating the obstacles faced by companies represented by the organizations that these three ladies represent in their day-to-day functioning, introduced by their real names, did not suggest that this conversation would end here. It feels as this was a small announcement for their takeover of the economic “stage” in 2019, it was like an announcement for many subsequent meetings, in wider composition, with even louder stances, with even stronger arguments, present everywhere in the media space. “2019 will be the year of unification of the private sector and equalization of its voice.”, says Despodov. Asked what is the basis of her claim, she says a major step forward in the cooperation between the chambers of commerce has already been made. This trend, according to her, will continue for the current year and will grow, and the reason behind this is that the entire private sector is united and together they are locating the challenges and everyday obstacles in the process of their work. “We are united and loud and we are not afraid to continue to be such because this country is more important to us, to the private sector, than any politician or political party. We want to continue working here, and we want our children to grow up and work here”, says Nikova-Bundovski. “And we call on the other chambers, the civil sector and all who want reforms and progress, to join us,” say our interlocutors, “because we do not inherit the country from our ancestors, but we borrow it from our children, and we don’t want our children to be halfway out of here since childhood”, says Diana Despodov. And if this year, so confidently and clairvoyantly proclaimed by the Government as economic year, be appreciated by its beginning, there is no doubt that after this amazing energy, the voice that will lead through the challenges for a better economy, better conditions for the development of the private sector, to achieve a higher standard for the citizens, will definitely be the voice of the business community.